Last week was a busy learning week for me. 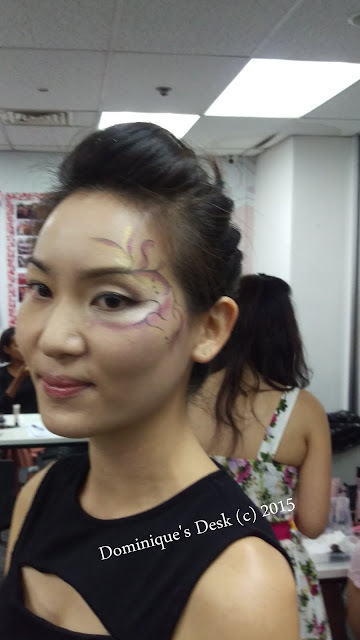 I attended my first creative makeup workshop. The makeup artist showed the audience how to create a simple yet interesting look for Halloween. Doesn’t she look really cool with the face art ? The design was drawn on with eyeliner and eye shadow only. Impressive isn’t it? This look is certainly doable and I’m sure that I’ll be able to recreate it with sufficient practice. What is having a learning experience without good food to go along? Fellow Mary Kay Beauty Consultant J and I had a quick meal at Sushi Tei before our class . 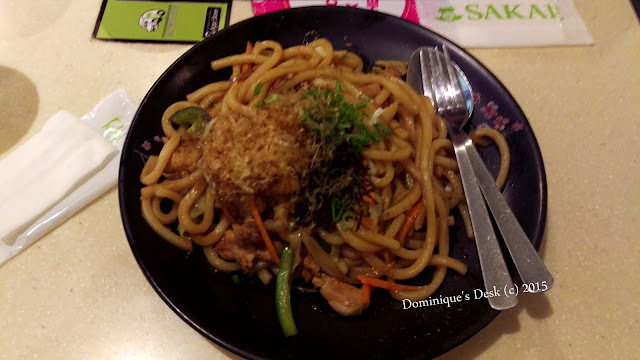 It was great to be tucking into a plate of fried udon as it has been ages since I had that dish. 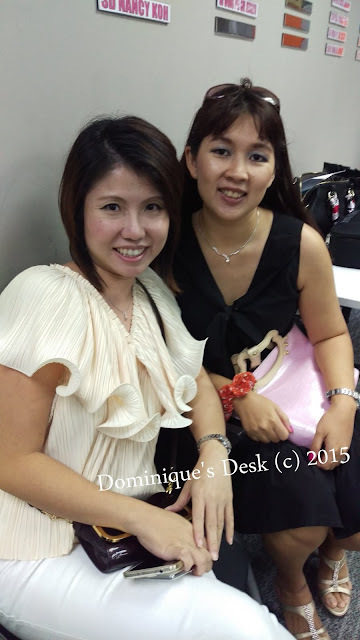 Both of us learned quite a bit that evening like how we can prep the skin properly before putting on such makeup and which colors complemented each other. Besides learning how to do creative makeup we were also shown how to braid and do up your hair for the evening. 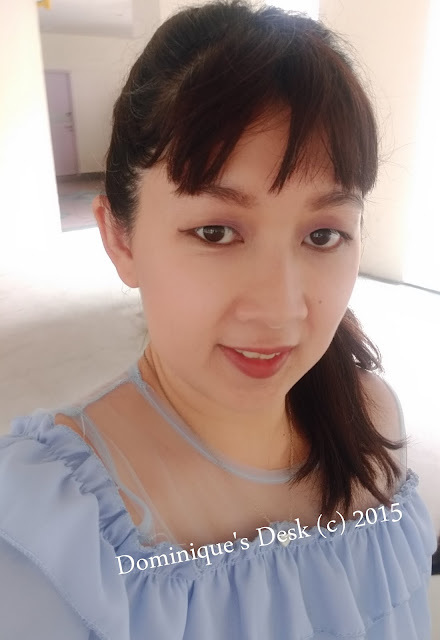 I tried out the side braid the next day to see how I look at it. I wanted to create the medium wavy curls using the curling iron I had at home but failed in my attempt. I guess I need more practice using the the curling iron if I am to create wavy hair at home. Have you learnt anything last week? Great face art, although I’m not sure I could carry it! I like the face paint design. Glad there was food involved too. I like the face art so cute 🙂 and your dress too, I love the color black and its design. That did turn out cool! I have a friend that paints faces for a living. I so wish she lived by me. She needs people to practice on at times. I’d love to have that done to me. Looks like a fun class. I’m hopeless with hair, much to Drama Teen’s horror when she has a formal dance to get ready for. I would like to attend a make-up class! I love makeup! I think we should all wear face art! Nice event! Glad you learned a lot and had fun. This is such a nice event to empower women like us! Those are simple yet elegant way to look on Halloween! Love to learn about makeup and hairdo also, not only for myself, but for my little girls who need it when they have some events, like in school. Lovely face art! I have such high regard for people with artistic talents! Well, if I have learned anything this week, it is knowing that getting old is actually enjoyable! Pretty you Dom. I also like to learn how to apply make up even if I can’t use it everyday. That’s a great learning event for you! The creative makeup for the Halloween is something different and refreshing. It’s simplistic yet captivating unlike the traditional scary or overdone faces we see on Halloween parties. I need a make up tutorial! I don’t know anything about make up! haha. PS: Love the noodles! I actually want to attend to any makeup lesson but I just couldn’t find any here in the province. I still need to go in the metro for that sake. I am planning to enroll in a makeup class soon if my time would permit me.